'Despacito' Quickly Becomes The Most-Streamed Song Ever : The Two-Way Luis Fonsi and Daddy Yankee's hit, with help from the remix including Justin Bieber, has generated more than 4.6 billion plays on digital services in just over six months. 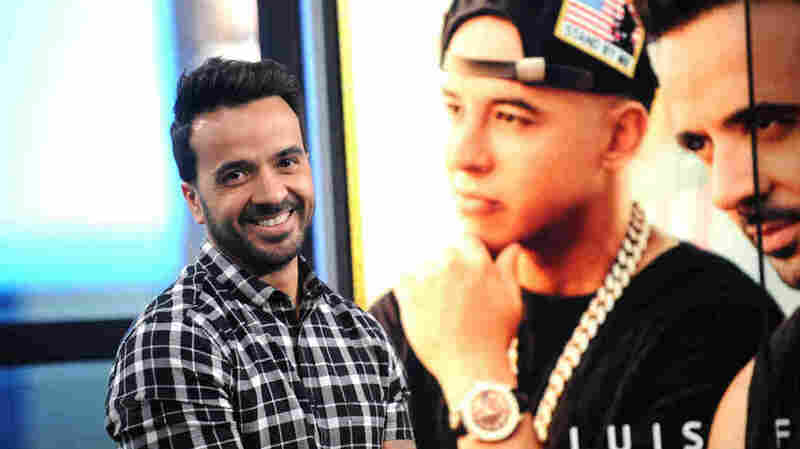 The speed with which "Despacito," by Luis Fonsi and Daddy Yankee (pictured behind him), became the most-streamed song points to the increasing popularity of music streaming services. "Despacito," the Spanish-language summer smash by Puerto Rican stars Luis Fonsi and "king of reggaetón" Daddy Yankee, is now the most-streamed song in history. On Wednesday, Universal Music, which released the song in January, said the original version of the hit and the subsequent remix featuring Justin Bieber have combined for 4.6 billion plays in just six months. That remix currently sits atop Billboard's summer songs chart. Together, Spotify and YouTube accounted for 92 percent of the song's plays. The speed with which the song reached this high-water mark is remarkable and points to the increasing popularity of music streaming services. According to analytics firm BuzzAngle, audio streams were up 58.5 percent in the first half of 2017. While "Despacito" was a bona fide global hit prior to Bieber's involvement in April, it generated relatively little interest in U.S. markets. But when Universal Music re-released the song with an English introductory verse by Bieber, "Despacito" gradually found its way onto the American pop charts. On the song's success, Universal Music Group chairman and CEO Lucian Grainge said in a statement that streaming "has opened up the possibility of a song with a different beat, from a different culture and in a different language to become a juggernaut of success around the world." To that end, expect to see major labels attempt to replicate the success of "Despacito" on other international hits through similar guest arrangements. "I think it's the beginning of a very long journey of new sounds," Charlie Walk, the Republic Records executive responsible for promoting the song, told Billboard last month.